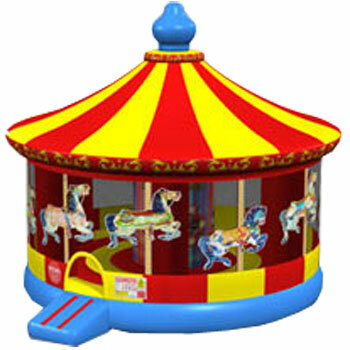 If you want a one of kind, unique bouncer at your next event rent this super cool and colorful carousel inflatable. Designed with popping red, yellow, and blue colors and saddled horses printed around the outside, this bouncer will complete any party. With a huge circus tent ceiling and a large circular bouncing area this will certainly have all of the adults talking and all of the kids jumping for joy.